Wildlife Enthusiast Magazine is supported by a number of leading companies and organizations in the hunting, fishing, and outdoor recreation industries. We are proud to be associated with the following partners. If you are interested in joining them in furthering our mission to serve female hunters, anglers, and outdoor enthusiasts, please contact us today! Created in 2010, the American Hunting Lease Association (AHLA) is committed to serving the hunting lease industry by reaching and educating landowners and hunters to the many benefits of a properly executed hunting lease. The AHLA believes the hunter/landowner relationship is the key to preserving quality hunting habitat and ensuring hunters can access that property safely. As the nation’s recreational fishing trade group, American Sportfishing Association‘s members include sportfishing and boating manufacturers and representatives, allied manufacturers, independent and chain outdoor retail stores, state fish and wildlife agencies, conservation organizations, federal land and water management agencies, angler advocacy groups, outdoor media groups, and journalists. Babes with Bullets is the only traveling firearms academy in the U.S. to offer handgun and rifle training to women at all levels. Taught by an all-female team of national and world shooting sports champions and supported by Smith & Wesson, Babes with Bullets’ three-day gun camps are designed to teach women to safely and confidently handle and operate a firearm in an informal atmosphere. A sporting goods retailer with deep roots in Montana, Bob Ward’s Sports & Outdoors is proud of its heritage and the tale of its founder, Bob Ward. Though a skilled jeweler, Bob’s love of hunting and fishing led him to become a gunsmith. His business grew to include fishing tackle manufacturing. At age 69, Bob was featured in “Ripley’s Believe it or Not” after he’d successfully hunted a black bear with a bow and arrow. During the Dust Bowl in 1937, North America’s drought-plagued waterfowl populations plunged to unprecedented lows. Determined not to sit idly by as the birds dwindled beyond recovery, a small group of sportsmen joined together to form an alliance now known as Ducks Unlimited. The organization has since become the world’s leader in wetlands and waterfowl conservation. Get Outdoors TV is a web-based, digital, on-demand video channel featuring streaming TV shows and videos on all things outdoors. Offered free to viewers, Get Outdoors TV focuses on a variety of related topics, including shooting sports, hunting, and fishing. It will continue to expand to offer content on hiking, camping, and even more extreme sports, such as ATV adventures. The International Game Fish Association (IGFA) is a not-for-profit organization committed to the conservation of game fish and the promotion of responsible, ethical angling practices through science, education, rule making, and record keeping. IGFA also is devoted to the collection of historical information and artifacts related to the history of sport fishing. Keep America Fishing provides an easy path for reaching the decision makers in Congress, state capitols, and town halls around the country. The organization gives the public a place to learn about the issues we’re facing, unite our efforts as a community, and present a strong voice. When millions of Americans come together and ask our political leaders to vote in favor of recreational fishing, they will listen. The mission of the Lady Bass Anglers Association (LBAA) is to provide women with an opportunity to fish professionally, grow the sport of bass fishing, and build a program that will provide younger generations with more opportunities to compete in the sport. LBAA members share not only their love for bass fishing, but also the desire to help pave the way for future professional lady bass anglers. Wildlife Enthusiast Magazine is a proud member of the National Shooting Sports Foundation (NSSF), whose mission is to promote, protect, and preserve hunting and the shooting sports. Formed in 1961, NSSF has a membership of more than 12,000 manufacturers, distributors, firearms retailers, shooting ranges, sportsmen’s organizations, and publishers. Founded in 1973, the National Wild Turkey Federation (NWTF) is dedicated to the conservation of wild turkeys and the preservation of our hunting heritage. Since 1985, NWTF volunteers and partners have raised and spent more than $488 million toward protecting wildlife habitat. The organization is making a difference not just for wildlife and wild places, but the hunting lifestyle as well. Pond Hopper Nation‘s mission is to bring all Pond Hoppers together—from beginners to professionals—to educate, entertain, and share their love and passion for fishing with the world. As an example, Pond Hopper Nation hosts a number of “Teach a Child to Fish Days” for girls and boys all across the country, where the next generation of anglers learns how to fish in a fun, relaxed setting. Prois manufactures and markets the highest-performance hunting and field gear for women. The company’s vision is to be the best in the market for female hunting and field gear. Being the best means providing unsurpassed quality, top-notch customer service, cutting edge technology, and a clear vision for future growth, so Prois does not just create customers; they create fans. 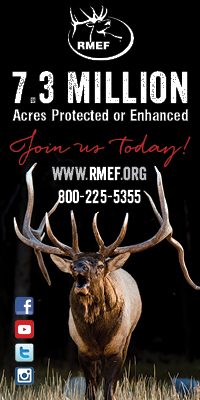 Founded 30-plus years ago and now fueled by a membership of more than 227,000 strong, the Rocky Mountain Elk Foundation (RMEF) has conserved more than 7.3 million acres for elk and other wildlife. RMEF also works diligently to open and improve public access, fund and advocate for science-based resource management, and ensure the future of America’s hunting heritage. Rutting Ridge Cellars was founded on the belief that well-balanced Cabernet Sauvignon and Chardonnay wines are ideal for pairing with elk and other wild game dishes. Equally as important about these great wines is the cause: for every bottle sold, Rutting Ridge Cellars donates $3 to benefit the Rocky Mountain Elk Foundation’s wildlife and habitat conservation efforts. A great wine for a great cause! Brought to the public by the National Shooting Sports Foundation, Step Outside is a comprehensive guide to local fun in the great outdoors. Step Outside publishes local event calendars and other related content for more than 4,500 communities all across the U.S. Some of the topics that are featured include hunting, shooting, archery, fishing, camping, hiking, motor sports, water sports, and more. For more than 50 years, West Marine has been the premier retailer of boating, fishing, sailing, and paddling gear. With nearly 250 stores located in 38 states and Puerto Rico and an e-commerce website reaching domestic, international, and professional customers, West Marine is recognized as a leading resource for anglers, sailors, cruisers, and paddlesports enthusiasts. A unique cookbook by Kristy Crabtree—who is an avid hunter, wild game enthusiast, and foodie—Wild Game Cuisine is an extensive collection of mouthwatering, easy to make recipes featuring elk, venison, antelope, bison, waterfowl, fish, and more. It is a simple cookbook created for hunters and anglers, featuring more than 100 delicious wild game recipes from Kristy’s personal collection.